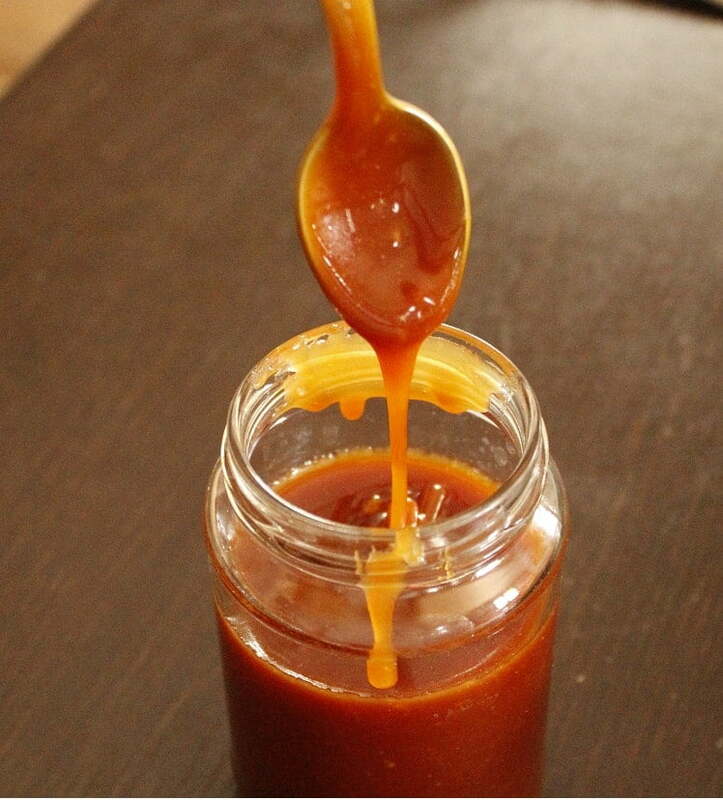 Caramel is made when sugar is heated and becomes a liquid. As it continues to cook it becomes golden brown and has an intense, deep flavour from the caramelization of the sugar. It can be eaten alone as a candy or used to flavour other candies, desserts, or beverages. To make caramel, put the sugar in a heavy saucepan or a non-stick frying pan and mix on medium heat. The sugar will soon start melting. To help the procedure, you can wet the sugar with 1 tbsp water. I prefer adding a tablespoon of lemon juice for its flavour. The quantity of water/lemon juice must be enough so that sugar must resemble like wet sand. You have to mix regularly, scraping the sides of the pan with a heatproof utensil, until you see the sugar becoming liquid. Keep mixing and the sugar will become darker and darker. The colour is up to you. When making caramel, I prefer it to become dark amber. As soon as it is ready, carefully pour it into your heatproof dish or divide the mixture into ramekins. You can use it as a base to make bread pudding, biscuit pudding, creme caramel or flan (my next post), etc. When done, add water to the frying pan immediately, as it will solidify as soon as it cools and it will be difficult for you to clean it. In case it solidifies, add hot water, enough to cover the traces of the caramel and let it soak for a few minutes so that the caramel may liquefy again. When the caramel cools, the amber liquid will become hard again unless some other ingredients, such as fat (butter and cream) are added. At this stage, if you want to make the salted caramel sauce, all you need is to add are these two ingredients. When adding the butter, the caramel will bubble but continue mixing until the butter is incorporated. Remove from the heat and add the heavy cream and continue whisking. This part needs more attention so that you do not burn yourself. You can add any flavour you like and if you want salted caramel, add the salt, mix and set aside to cool before serving or storing in another container. Just replace the granulated white sugar with cane or brown sugar. Use it as a topping for desserts, such as ice creams, sundaes, cheesecakes, to flavour frostings, etc., or add it in drinks, such as coffee, milkshakes, latte etc., or to make other desserts, such as cakes, brownies, cookies etc. Put the sugar and lemon juice or water in a small non-stick frying pan and cook on medium heat until the sugar melts. Stir constantly until the sugar starts turning into a deep amber colour. Remove from the heat and mix in the butter. Add the salt and cream and mix until it stops bubbling. Put back on the heat and mix for another minute. Caramel is when sugar is cooked and becomes a liquid. It becomes golden brown and has an intense, deep flavour from the caramelization of the sugar. Put the sugar, lemon juice or water in a small non-stick frying pan and cook on medium heat until the sugar melts. Absolutely irresistible! I too love to add lemon juice for the extra flavour.